For the environmentally aware adventure traveler, kayaking is a great option either as a vacation theme or a day's activity. Here's rundown on what kayaking is and what you'll need to get some time on the water. Kayaking is a water sport which lets you experience anything from peaceful paddles across calm lake water, to sea kayaking on the ocean, or even whitewater kayaking down mountain rapids. There's a choice of kayaking style and destination for everyone regardless of age, skill level, or adrenaline addiction. Kayaking is different from canoeing by the kayak having a closed cockpit where a canoe has an open cockpit. However, there are many sit-on-top kayaks, that are quickly getting more popular. Sit on top kayakers also use a two bladed paddle. Another major difference is in the way the paddler sits in the boat. Kayakers sit in a seat on the bottom of the boat with their legs extended out in front of them. In a canoe, canoeists either sit on an bench seat or kneel directly on the bottom of the boat. Kayaking has continued to increase in general popularity since the 1990s. Kayaking is also very eco-friendly as once you have the gear, there are no CO2 emissions, no waste products, and it doesn't wear on the environment where you go for a day out. Where can I go kayaking? Kayaking is available anywhere you have open water, so all you really need is your local lake. However, it's more exciting to mix in a kayak expedition during your vacation and that gives you some really cool options. Creek kayaking is what it sounds like, much like a canoeing outing you'll gently float down a creek, and relaxing in the surrounding nature. This is the easiest introduction to kayaking and a great way to build your skills. Sea kayaking sometimes also referred to as ocean kayaking involves taking kayaks out on to the ocean or other open water. Sea kayaking can involve short paddles with a return to the starting point or "put-in" or expeditions covering many miles and days. 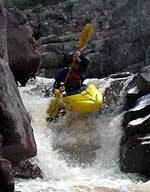 Whitewater kayaking can be had almost anywhere there are large mountain ranges and river rapids. Colorado is a favorite destination in the USA, but the Alps are also popular as are the Scandinavian mountains. For more ideas, simply search Google for 'kayaking tours'. First thing you need is a kayak. But since this is a really hard item to transport, it's one you'll most often rent from your kayaking tour organizer. They will also have other safety equipment available, such as helmets, life jackets, rescue transponders, and possibly 2-way radios. However, if you get bit by the kayaking bug, you want to have your own gear ready to go. Once you have the basic kayak gear, you can of course get more advanced and buy special kayaks for different locations, maybe a sea kayak or a freestyle kayak if you want a different experience. Of course, after these 5 classes there are many sub-classes. For example, a fishing kayak is simply a general recreation kayak outfitted with features and accessories that make it an easier kayak to fish from. Also within these classifications are many levels of performance which further separate the individual models. In other words, not all touring kayaks handle the same. Most kayaks are designed to be paddled by a single person, but there are tandem and triple cockpit kayaks available. However, most times you're best off renting gear wherever you're going. After all, kayaking can be done in such far flung places as Brazil, Scotland, Germany, Thailand, the Pacific Northwest, or even on your local lake. If you've got experience with a kayaking vacation, please leave your tips below for others to learn from. Last updated by jack on 14 December, 2014 in Travel. I am writing you from www.compulsivetraveler.tv. We are a website publishing travel video content on the web. We have produced a TV series for over ten years that has aired on CBS and the Travel Channel. We are developing a list of Bloggers to promote on our site as part of an online travel community. We would like to work with you to promote you on our site, send you press releases and offer you our quality videos to enhance your blog. We are interested to hear your feedback.